A normal day at the golden throne, the warhammer god sits and smiles. Today he more then smiles, he is laughing his head of! When I started with my Death Korps of Krieg army maybe five/six years ago I've been frustrated at Games Workshops army transporter. How can a company that's makes a game based on units of ten make a army transporter made for nine minis??? I've bought them anyway but it has always been a big mes picking up and down minis when gaming since you have to be quick and don't ruin the flow of the game. Almost ones a month for all these years I've been eyeballing at http://krmulticase.com/ dreaming of buying some custom foamtrays. Buying foam is as much fun as buying socks. So boring! But, for a couple of days ago I decided not to wait anymore. I measured and ordered and three days later my package arrived. The very same day it was possible to read at Games Workshops homepage about there new foamtrays with room for ten minis. I'm happy that I finaly placed the order! What makes my order a bit better then GW's is the bottom layer is made for my heavy teams. So in the future I will probably only need one case when it's time for gaming, not two. 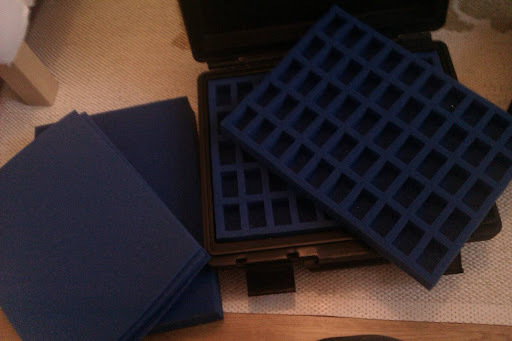 I would gladly recommend krmulticase, quick delivery and the foam is in good quality. Not cheap but without a doubt worth it. But GW doesn't sell the foam inlays, the sell cases.